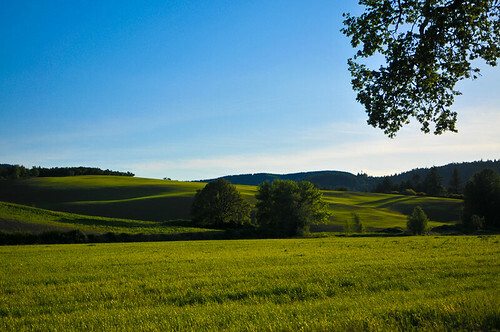 Many roads like this beckon adventure seekers just miles west of downtown Forest Grove. 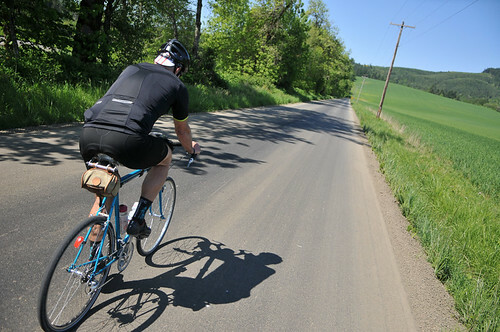 This ride recap is sponsored by 21st Avenue Bicycles. 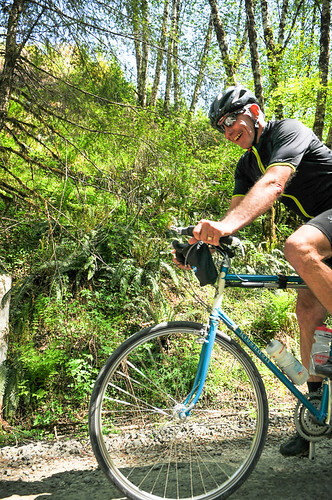 They’ve stepped up to bring you more coverage of the great bike adventures that await right outside your door. 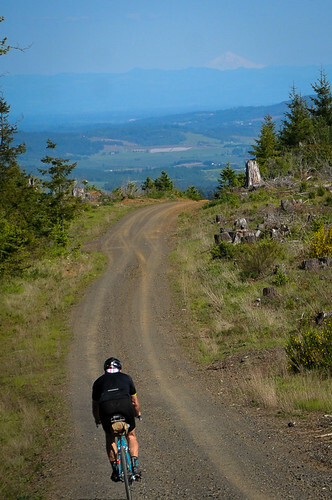 Stay tuned all year long as we explore the best backroads and bikepacking spots in Portland and beyond. 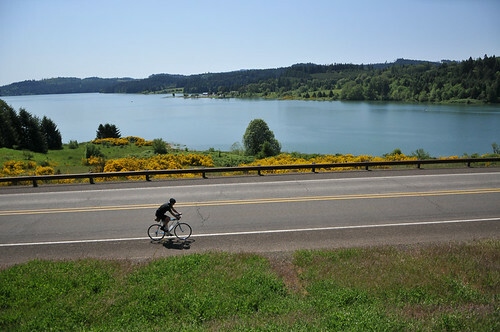 Nearly everyone who rides around these parts knows about Hagg Lake and the beautiful road that winds around it in the hills west of Forest Grove. 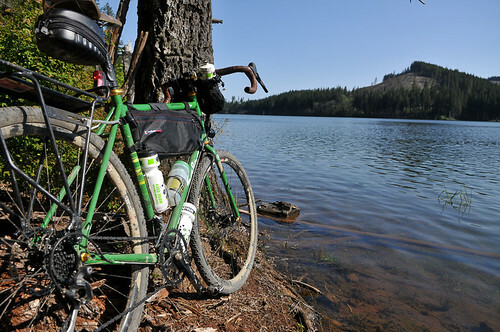 But did you know there’s another body of water a bit further west that’s also worth checking out on your bike — especially if you love exploring forests and logging roads? 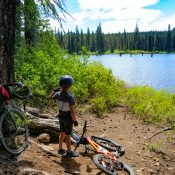 During a recent stay at McMenamins Grand Lodge — which makes a perfect base camp for exploring the great cycling around Forest Grove — I mapped a route to Barney Reservoir. 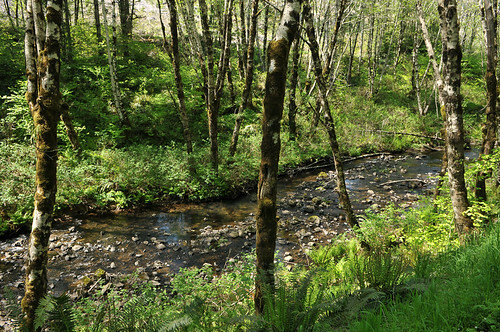 Nestled in the forest at about 1,600 feet above sea level on North Fork Trask Road, the reservoir supplies drinking water for nearby cities including Beaverton, Tualatin, Forest Grove, and Hillsboro. 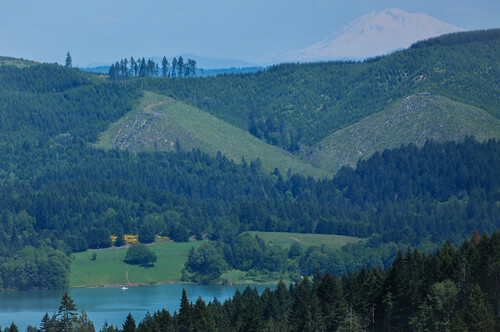 It’s open to the public for fishing and canoeing, but it doesn’t see much use because of its relatively remote location and due to the fact that it’s larger and closer sibling Hagg Lake steals all the attention. 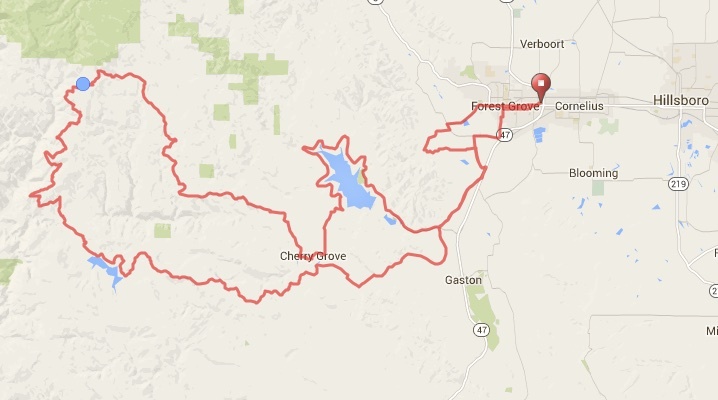 Our route for the day: 74 miles, 5,700 feet of climbing. 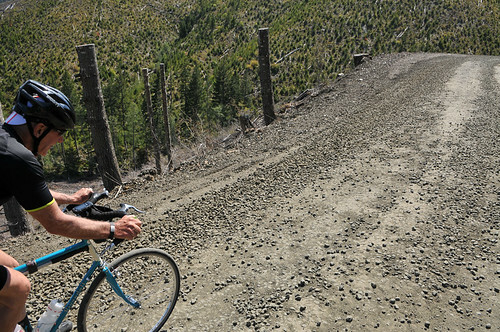 My partner for the day was gravel riding pioneer and local legend Dan Morgan. 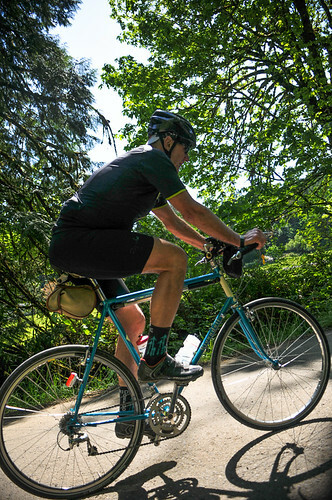 Morgan is the leader of the Beaverton-based “Gravel Roal All-Stars,” an informal group of riding buddies who seek out the best backroads on the west side (and beyond). 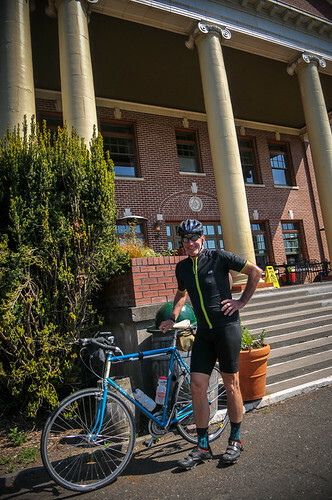 After a hearty breakfast at McMenamins Ironwork Grill, Dan and I set off from the Grand Lodge. 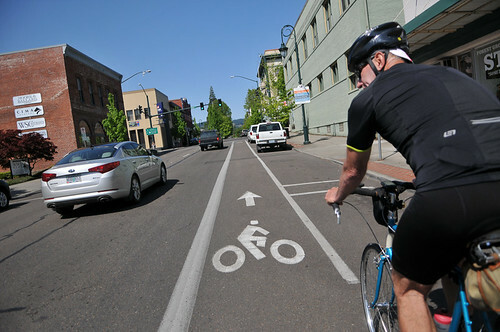 The ride started with a nice spin through the heart of downtown Forest Grove. What I love about riding in this area is you are always just a few pedal strokes from quiet and beautiful country farm roads. 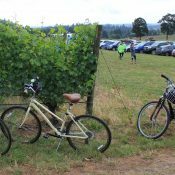 As we rode southwest from town, we found great alternatives to Tualatin-Valley Highway (thanks to RideWithGPS) which allowed us to pedal by wineries and quiet old farming towns like Dilley and Scoggins Valley. 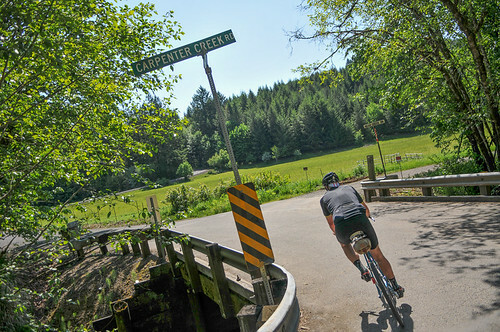 Carpenter Creek Road is a gem. 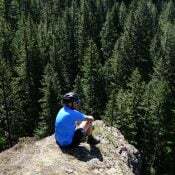 Since I was training for the Oregon Outback we opted to make the ride a bit longer by doing a quick jaunt up and around Hagg Lake. About three-quarters of the way around the lake we took a right on SW Lee Road which dropped us right down into Cherry Grove, an unincorporated community that was founded in 1911. Eerily quiet, the quaint roads up Cherry Grove quickly turned skyward and we began our climb up to where the pavement ends on Stimson Mainline Road (our next 35 miles would be on rocky, dirt logging roads). 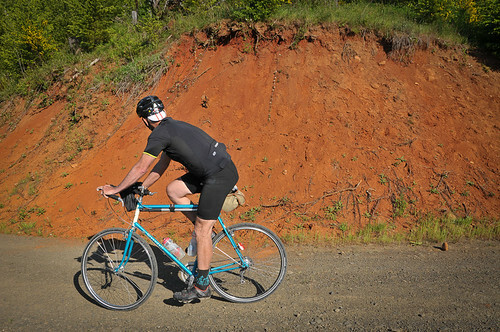 To get from downtown Cherry Grove to the highest point on the ride we would climb about 2,500 feet in 13 miles. Our view of the surrounding mountains and peaks got better with each turn of the pedals. Mt. Hood from high above Forest Grove. Mt. Adams off our right shoulder as we veered west. 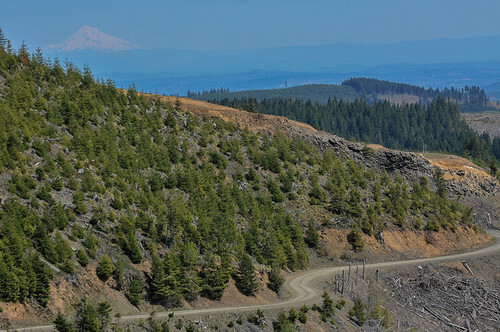 As an aside, nearly all the logging roads we used on this journey are owned by Stimson Lumber Company (part of their Forest Grove Complex). Usually I don’t think much about that, but we were actually stopped by a Stimson employee on this ride. “We’re closed,” said a nice man in a new full-sized pick-up truck. He then proceeded to explain how these roads are only open to the public after 5:00 pm on weekdays and all day on the weekend. 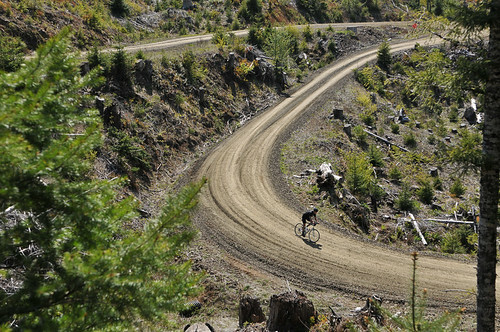 That was the first time I had ever heard of private logging roads having specific hours. Thankfully, the Stimson guy was a good sport and let us finish our loop. And boy, what a loop it was! 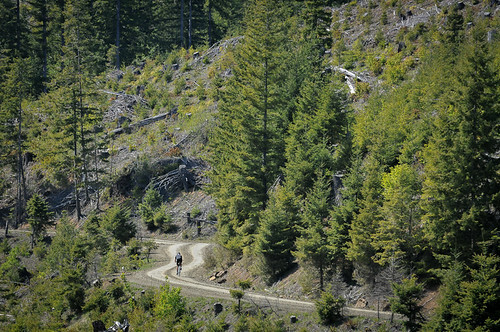 While we rode through lots of active logging sites, we were also treated to some big stands of trees and healthy creeks. 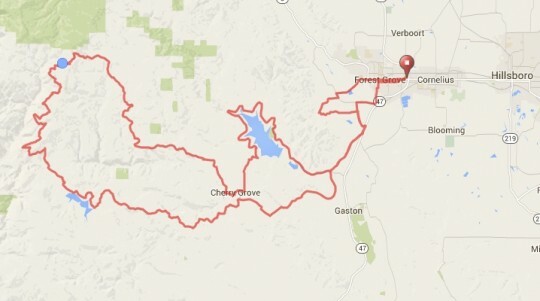 As the miles wore on, I think Dan and I were both starting to wonder if we’d ever get to the Barney Reservoir. When the reservoir finally came into view, I knew exactly where I wanted to be. I rode right to its edge and dipped my face and hands in the clean and cool water (water that happens to supply several nearby cities). After the reservoir, the hits just kept on coming. Remember that big climb at the start of our ride? 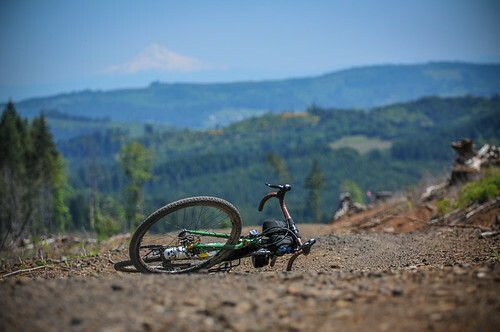 Now it was time for the descent, which was nothing short of a gravel road thrill ride (I was was actually enjoying the downhill a bit too much and flatted after hitting a rock at full speed). 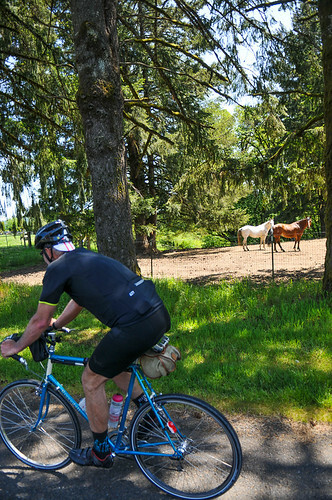 On our way back into Forest Grove, we marveled at the verdant countryside and even found a sweet little bike path (the B Street Trail) that dropped us off right among the town’s stately historic homes. 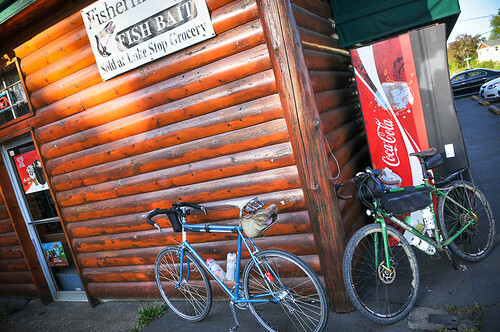 Quick refuel stop at store in Scoggins Valley. 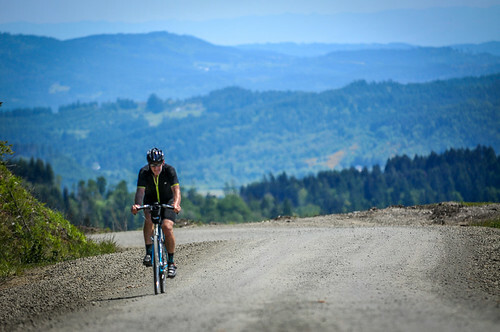 If you ever find yourself in this area, or happen to be staying at McMenamins Grand Lodge and have a few hours to kill, I highly recommend exploring some of these roads — just be sure to respect Stimson’s hours and be grateful for their permission to use them. — Read more of my recent adventures here. Just a little historical tidbit, at Mile 38 was the site of an old timber camp nicknamed Timbuktu because of it’s remoteness. You also go through some Weyerhauser land. Their rules are a little more lax than Stimson’s, but always good to know who’s land you’re riding on and the applicable access rules. 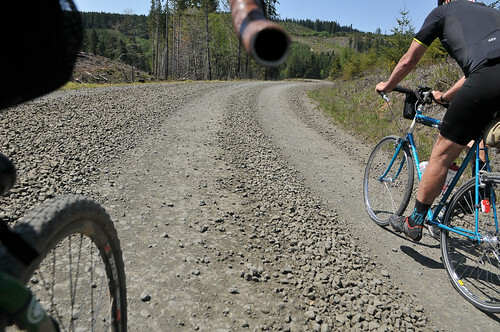 I’m interested in trying some gravel. I have a bike that’s very close to the same as Dans. What size tires does he run, and with what psi? thanks Also that looks like a good time! Thanks for this type of post! 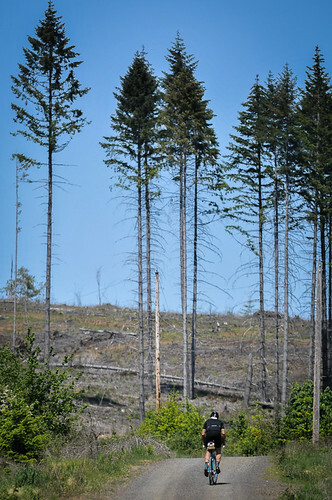 Where does one go to find out if your going to be riding through some companies industrual forest land like Weyerhauser,Stimson, etc..? You can basically assume the vast majority of the Coast Range is either public (State Forest, National Forest) or private logging land. The public areas are easy to figure out beforehand and obviously you can ride when/where ever you want. If you ride out there enough you get to know which companies generally own certain areas and what access rules are. This is why I’m going to buy a new bike soon. Snark aside, I would love to read a story about this. 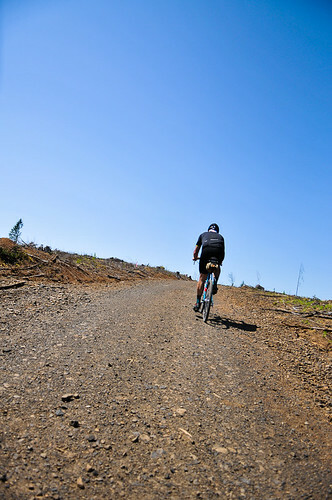 Fear of accidentally trespassing and getting hassled out in the middle of nowhere is one of the major things keeping me from trying gravel riding. 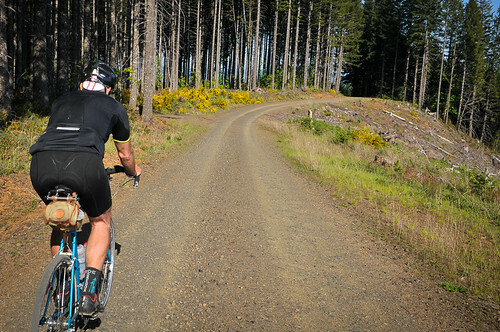 That’s a good idea Steve O. I’ve ridden a lot of timber company-owned roads and they all allow bicycles. 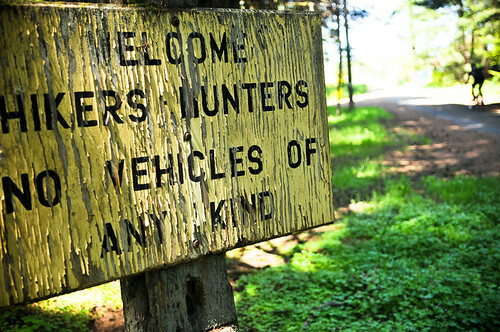 I really don’t think “vehicles” in this case and others refers to bicycles. They’re referring to cars/trucks/ATVs/Mopeds. 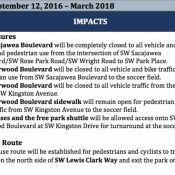 Like the guy said, bikes are fine during those specific hours. But yes, I’ll consider putting together a story about access. Maus- I just replaced an overdue bar plug after seeing a super gruesome halfpipe collision between 2 BMX heroes.. Makes your average “core sample” seem tame. Seth Patla lives in Forest Grove. Just sayin’. Logging truck drivers assume they are the only ones on the road in areas of active logging, and tend to use the entire road, at speed. 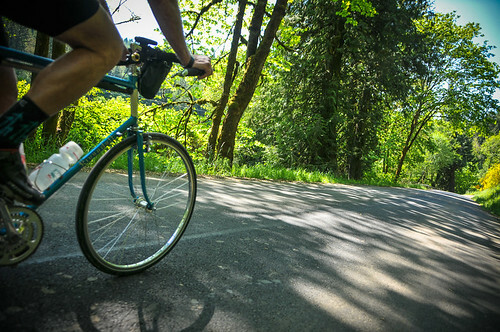 A bicycle is an unexpected surprise, so you need to have a bail out option if you hear a truck coming. 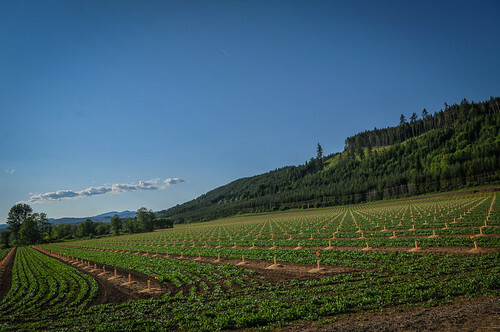 I learned this on the Tyee Access Rd, west of Roseberg. Had to help a buddy out of the brambles lining the road. No serious injury but plenty of scratches. No gates or signs but we could have been on private land. The truck driver didn’t stop to explain. 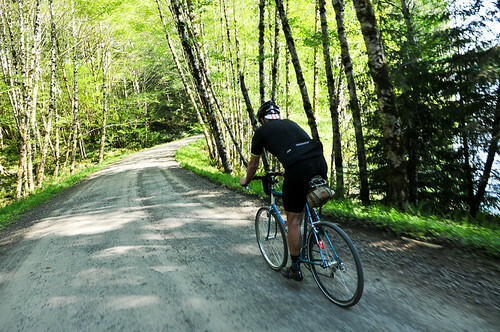 If you’re on gravel, they travel fairly slowly, and you can hear them from miles away. It’s easy to get off the trail if you plan ahead.